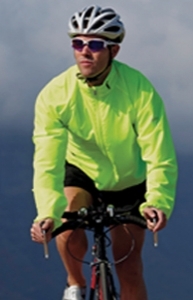 Description Windshell lightweight polyester fabric - long back with scooped elastic hem. Ventilated back panel. Stretch bound cuff with elasticated thumb loops. Reflective Detail for enhanced visibility. Wind resistant fabric. Water repellent finish. Unit prices including single colour printing in one position. 50 units €23.00 / 100 units € 21.50. Prices are per unit and exclude vat and print set-up charges.